There was a happy ending to this story, but that’s not always the case when you can’t find mom. 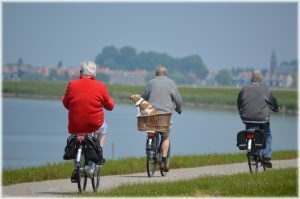 On a cool winter evening, a man we’ll call Fred was out walking the dog, and his elderly mom, Lynn, wanted to go along. Imagine Fred’s surprise when, 20 minutes later, he stood up after scooping up some dog poop. He turned to say something to his mom, and she wasn’t there! The snow was well packed and there are too many footprints to figure out which way she went, so Fred retraced his steps home as quickly as he could. His mom, in her 80s, had trouble with remembering things and didn’t speak clearly, both results of a recent stroke. Fred was in a panic as he approached home and saw she wasn’t there either. Where could she be? Although Fred’s mom was dressed for a short winter evening walk with the dog, she was not dressed to be outside for a prolonged period. Fred called the police, and members of the family to let them know Lynn was on her own, on foot, and possibly disoriented. Somehow, Lynn made her way several blocks off the path they were on, to a bus stop. She stood patiently waiting for a bus along a route she hadn’t been on for years, yet was obviously familiar to her. Meanwhile, word went out from police to all the bus drivers and cabs in the area to keep watch for her. Within two hours of the call to police, a bus driver had welcomed her onto his bus to warm up, contacted dispatch, and Lynn was returned back home. This wasn’t just lucky. This was also part of being in a city where seniors are valued and respected. It’s a city where people take such an announcement seriously. It’s a blessing. 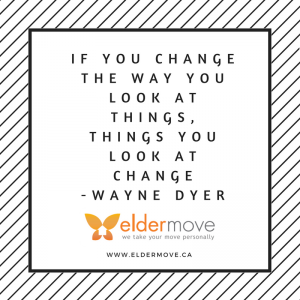 At Elder Move Inc., we help people to organize, downsize, in preparation for moving or to age safely in place where they are. We also provide packing and unpacking services with the work completed by our team of senior move specialists. If you’d like some more information, get in touch with us here. What’s Your Third Act Going To Be Like? The idea of the “third act” was made popular by Jane Fonda, when she gave a Ted Talk, and lots of other people have talked about it since then. 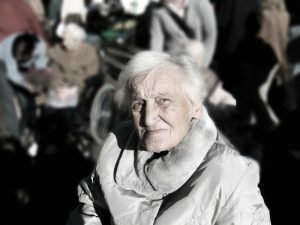 She says that since we are living about 34 years longer than our grandparents, it’s as though we have been gifted with another lifetime; a third act. You can see Jane’s presentation here (11 minutes 20 seconds). Isn’t that inspiring? I love how she describes the third act; it’s a longevity revolution, an opportunity to age as potential instead of pathology. We know that positive people live longer than negative people. And, we understand that people who have strong relationships live longer and tend to be more positive than people who are alone (or lonely). Hmm. Food for thought here. Of course, being alone or lonely can be even harder for folks who are divorced or widowed. They are alone, and that could naturally position them to become lonely or negative, even if they were positive people, right? Instead, what if the Third Act was a time for rejuvenation and renewal? A time to explore our own potential, well-being, and happiness instead of deteriorating and sliding into obscurity sounds good to me! That’s what happened to a woman we’ll call Barb, after Barb’s Dad died. Barb’s mom, Annette, was lonely, sad, and always seemed angry after Adam died. Adam had been Annette’s one true love, and he was obviously a positive balancing force in their marriage. He was especially helpful to Annette after he retired, including helping her to manage her advancing arthritis. After he passed away, Annette was left with a huge garden to attend to, a house that was too big for just one person. She resented the changes, missed Adam fiercely, and became miserable. Barb encouraged her mom to sell the family house, and move from a neighbourhood where she was almost always alone, into a seniors’ residence. Annette resisted for a months, arguing that she didn’t want to leave the place where she had so many memories. Eventually, though, she admitted that looking after things on her own was simply too much. She sold her home, and has hardly looked back since she moved into her new place. “Honey, I have to call you back,” Annette often says when Barb calls nowadays. “I’m off to play cards.” Or take an exercise class, or volunteer to teach her new neighbours how to knit. She keeps her calendar filled as much as she wants to, without time to feel lonely, or dwell on her arthritis. 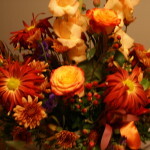 At Elder Move Inc., we help people to organize, downsize, move, pack, and unpack. If you’d like some more information, get in touch with us here. Design Your Home to Avoid Trips and Falls! Are you a senior who has had a trip or fall at home? Though the initial design of your space may have been ideal at one time, things can change as we age. It’s not uncommon to need some updating in order to keep up with changes in our lives, including things like eyesight, balance, and low lighting. 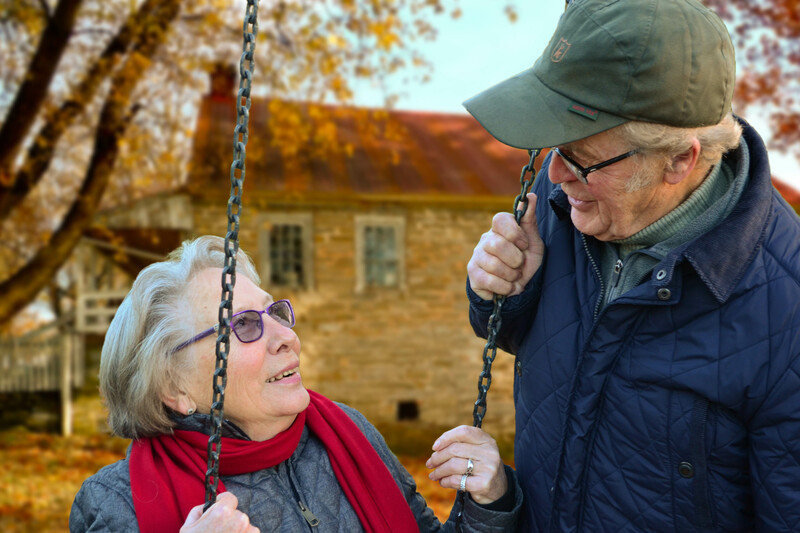 Falls are a major factor in hospitalizations, causing up to 90 percent of hip and risk fractures, and 60 percent of head injuries to older adults in Canada. They are also the number one cause of injury related death in seniors.Those are sobering statistics, and we want to give you the tools to avoid them! While we love to create a space a home that is warm and welcoming, the use of area rugs in a big problem with tripping. Sometimes the “look” of a big floor area can be too much, and we fill the space or create warmth by adding a rug. But sadly, even when they seem to be well secured, people regularly trip over corners and edges of area rugs. Do you hold onto the furniture as you move around your home? Are you using your hands to help you as you stand up? Do you take medication that makes you feel unsteady or lightheaded? Do you get up in the middle of the night to use the washroom? Do you wear slippers or socks when you are at home? Are you using a cane or walker in your home? If you’ve answered ‘yes’ to some of these questions, speak with your doctor or nurse practitioner about how to protect yourself from a fall. They may wish to review your medications, assess your health, and check your vision. Sometimes a few simple changes at home are all that’s needed to make things much safer. Elder Move Inc. staff are specially trained to help you to organize your home, and if you are moving we will also pack, relocate, and unpack your belongings. We work hard to provide you with a safe, comfortable home. You can contact us here and we’ll help you get started! Make Your Home Cozy, Quick! 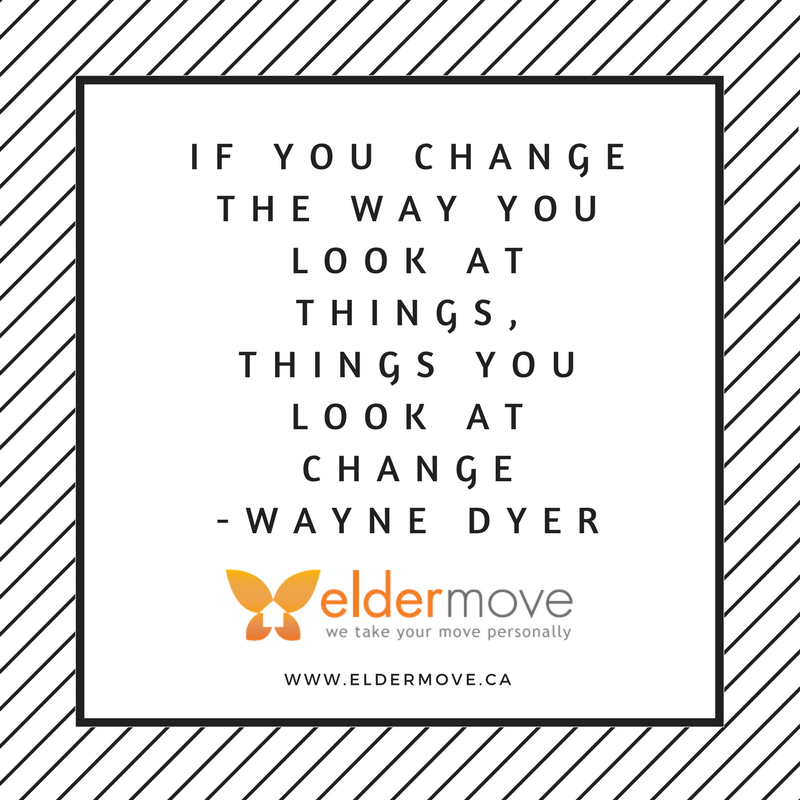 At Elder Move Inc., we help people to downsize, move, and get settled into new spaces. Often, the new space is smaller than the previous one, and that can take some getting used to. Here are some of our clients’ favourite ways to settle into their new space, quickly creating something cozy. 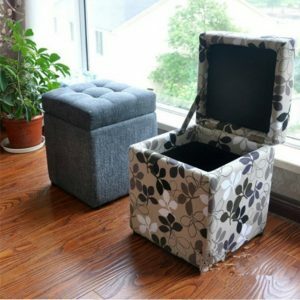 Stools and coffee tables with storage space are perfect for tucking away throw blankets, cushions, and all those remotes you use for the television, pvr, stereo, cable box, and more. Ikea sells a lightweight, small drill/screwdriver combination tool that makes putting cabinets together – so much easier than being on your knees sweating through it with an allen key! The bits that come with the drill can be used on practically all your home organizing projects, including the ones from Jysk, Wayfair, and Canadian Tire. Using glass or crystal and hanging mirrors helps to project light and makes your space seem bigger and brighter. They are easy to keep clean and shiny with inexpensive microfibre cloths. Cables from your television, computer, and charges can look untidy and make your space cluttered. Cutting space out of the back of cabinets and using cable covers to contain the mess keeps your space looking cheerful and organized. Make sure that your cables are safely tucked away so things cannot overheat. Pare down your clothing so everything you need fits in your closet and dresser, and within your laundry cycle. If you do laundry once a week, there’s no need for 21 pairs of socks, or 10 pairs of trousers, or seven spring jackets. If you are tight on space, store seasonal clothes in totes to keep them out of the way. To make getting organized easy, limit yourself to make one change or one room at a time. If you’re in Alberta and you’d like some help downsizing and getting organized, or you are getting ready for a move, we’d love to hear from you. Please fill out the contact form here on our site. If we had a question, problem, or needed advice we turned to Mom and Dad! As our parents age, we need to step in to help BUT when and how? Every Sunday, our large family would get together at my in-laws home for dinner. As the years passed, the wonderful cooking we had grown accustomed to began to taste different and not enough food was being prepared. During kitchen cleanup we began to notice out dated and mouldy food in the fridge. It was at this point we started rotating Sunday dinners among our houses and Mom went from being the host to being a guest. We accomplished this in a gentle manner so that we didn’t hurt her feelings as she gave up making these dinners. This shift also ensured that she had one healthy nutritious meal each week and that none of us got sick. As I think back, this was the beginning of our roles changing. During a doctor’s appointment her son attended with her, the topic of driving came up. A written driver’s test was ordered to be followed by a road test. Mom never made it to the road test as no passing grade was achieved on the written portion. She blamed her son for taking away her license and therefore her freedom, not the fact that she could not pass the exam herself! Was this the right time to step in or should we have waited until someone got hurt or even killed? I felt sad for my husband as she mentioned the loss of her driving every time we saw her, until she finally forgot. A family I recently worked with had all the best arrangements in place for their mom. Her medications were blister packed and delivered by the pharmacy, home care was coming twice daily to administer her medication at the correct times, a companion service had been hired to come three times a week for company, there was bathing assistance, light housekeeping, meal preparation, a laundry service coming once a week, and nutritious meals were being prepared and delivered by her daughters along with any groceries or items she needed. The family was in daily contact with their mom and only minutes away if she needed them. During a visit the daughters found out that their mom was also paying someone in addition to everything else that was set up. This particular “friend” would “help” mom out, drive her places, stay for afternoon tea and a visit, go pick up unneeded groceries and supplies, take out the garbage, etc. In return, their mom was paying this person for the help. This family had done EVERYTHING right- they had arranged everything that was needed to keep their mom comfortable and did not feel they needed to take over her finances as she was still of sound mind, and yet the actions of an unscrupulous friend went unnoticed. Once again…when do we need to parent our parents? The best advice I can give is to help your eyes, ears, and nose open. Do not let the little changes pass without some investigation. An open dialogue with your parents on a regular basis will help you notice small things that may seem insignificant at first. Grab the milk out of the fridge yourself and notice anything out of place. Take note of how clean their clothes are and if the home is in order. Ask questions about their service providers. Remember that they are your parents and do not necessarily want to give up that role by asking their children for help, so you’ll want to do these things gently, but they still have to be done. We recently completed a project for Alex (not his real name), a client who was away on vacation when his mother passed away. Since she had been living in a long term care facility, we needed to get Mrs. B’s room emptied and her possessions packed up and moved out almost instantly. That’s what we do, and so that’s what we did. Mrs. B came from a great family who loved her dearly. Since she was a centenarian – more than 100 years old that means – her son Alex had hesitated for years to take his family on a big holiday “just in case” something might happen while they were away. But Mrs. B wanted her family to take the holiday, explore the world, and spend time together, so she encouraged her son Alex to book the tickets and get going. With some reluctance but looking forward to plenty of fun, off they went. A few weeks into their vacation, Alex called us in tears to say that his mom had passed away and he was overseas. He asked if we could pack up her room and deliver her personal possessions to his home, and to take anything suitable for donation to a local charity. We got everything done very quickly, and thanks to how easy it is to communicate by phone and email, Alex was in touch with us throughout the process, without having to catch an immediate flight home. This is exactly what we mean by our motto where “we take your move personally.” We treated Alex’s situation as if it was one unfolding in our own family. His mom’s things were moved quickly and efficiently, and the facility was able to prepare the space for a new resident in need of a high level of care within a couple of days. Alex and his family completed their vacation together, in a form of tribute to his mom and their grandma. There’s nothing like a small skiff of snow, some ice pellets, or a strong north wind to help you recognize how tough winter moves can be in our region. This is no small matter for seniors who need to move in the winter. Along with icy walkways, it gets harder for people, and especially seniors, to move around easily and safely when you are also bundled up in bulky coats, scarves, and boots. 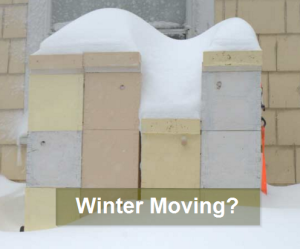 Winter weather really can make a simple move more complicated than it would be during other seasons, and things can get really tricky if you are all bundled up, trying to carry a big mattress to the truck when the wind picks up. 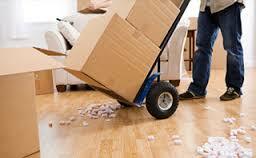 At Elder Move Inc. our job includes taking the stress out of your move. 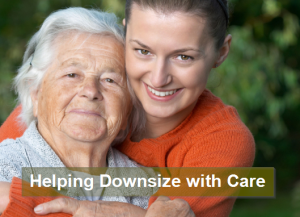 Instead of encouraging you to do it all separately, we are your one stop shop whether you are downsizing and organizing to stay where you are, or you are moving into a new home. Winter makes things more slippery, sure, but we’re very used to coordinating all the logistics, from arranging our team, bringing packing materials, booking elevators, directing moving trucks into loading docks, and we’ll even make sure we know where we’ve packed your cup and saucer or coffee mug. When it comes to your new space, we do also provide unpacking services. That way there are no boxes or wrappings to be getting in your way. If you are living in or moving to other areas, you can access qualified referrals to other senior move managers by contacting the National Association of Senior Move Managers. If you’re living in or moving to Edmonton, Alberta or the central Alberta area, we’d love to speak with you. Just call us at (780) 668-9767, or use the contact form here on our site. 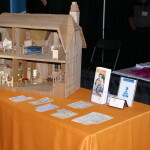 We were pretty excited to be part of a big trade show about two weeks ago. We met hundreds of people that day, and the energy in the room was inspiring! This was the 5th annual Fabulous@50 event, and our second year there, so we even became a sponsor this year. Pam Robertson, Ph.D. delivered a presentation on developing resilience that really had a lot of great ideas people can use to develop new habits as well as encouraging those habits in our children and grandchildren. I am not so certain I will take up her suggestion of singing exactly, but I can relate to how better breathing is helpful so I am thinking about taking up the trombone and seeing how that goes. I do find myself humming louder in the car than I used to do, and I know that there were other elements that I am going to use from her presentation. Being resilient is an essential life skill. Andrew Campbell of Invision Reproductions sponsored us by donating a beautiful digital frame plus an additional gift of 1000 photos or slides scanned for no charge! Thank you Andrew, for being such a great supporter of Elder Move Inc. and your gift. The winner was really excited when I called about their prize! Laurie Toth of Flower’s by LaTerre’s created a stunning bouquet of flowers inside of a giant teacup, which I presented to Pam as a gift after she spoke for us. 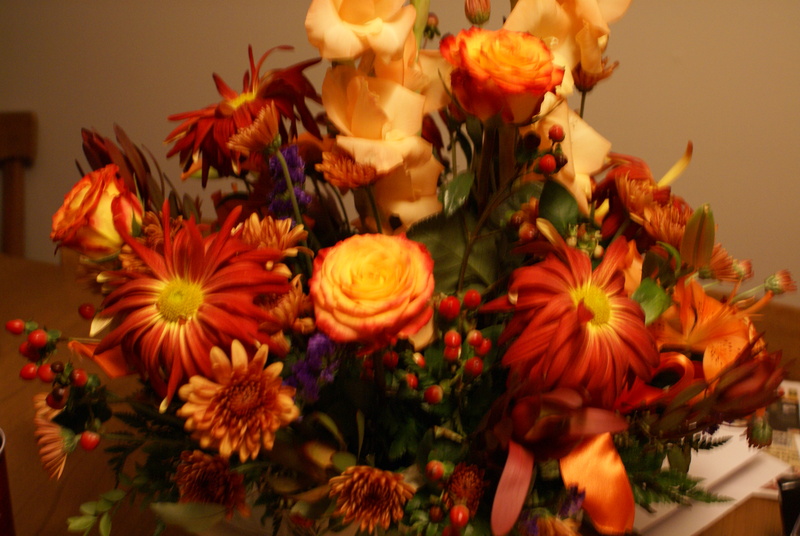 Pam reports that the arrangement lasted beautifully and was still going strong a week after the trade show! 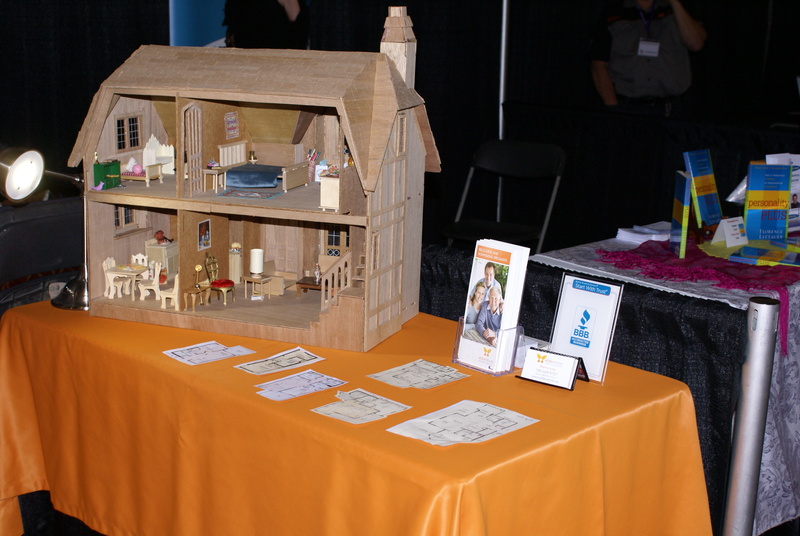 I love the energy of a trade show, and there were plenty of baby boomer’s at this one, many of whom are helping their parents – who are seniors or the elderly – to downsize, organize, and get things coordinated in their homes or relocated to a new space. That’s exactly what we do, in between trade shows of course!